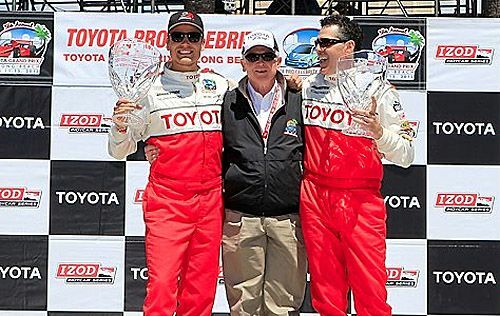 His career may be stalling but Adam Carolla showed some cajones in winning the 2012 Toyota/Pro Celebrity Race. Carolla, a comedian/actory who lately has been fired from most projects he is associated with except a self-produced podcast, sped to the finish line in the 2012 Toyota/Pro Celebrity Race, triumphing over a field of film, television, music and sports stars in what Toyota deems an "exceptionally exciting and competitive event. The roaring crowd witnessed a thrilling battle for first place in a tight field of drivers, with a late-race surge by actor Hill Harper that surprised drivers and fans alike." Scion drift driver and 2010 Formula Rookie of the Year Fredric Aasbo finished first in the Pro category. The pros had a 30-second handicap before taking off after the celebrities. Aasbo fought his way to a fourth-place finish overall, closing the 30-second delay of the professional drivers to end up just six seconds behind Carolla. OK, maybe we're being harsh on Carolla, who is on the right in the accompanying picture. After all, he is on the current season of Celebrity Apprentice on NBC. Oh wait, he was fired from that, too, after screwing up a project launching the Buick Verano. Let's focus on the positive. Toyota recounted in a press release that Carolla "made a daring maneuver when he passed the pole position starter, actor Kim Coates, as the two sped around a corner in the fourth lap. Carolla maintained his lead throughout the remainder of the race, despite the rally by Harper, who seemed to come out of nowhere as he challenged Carolla for the lead in the final laps. Carolla and Harper battled it out for victory, with Carolla finishing less than one second ahead of the "CSI: NY" actor." "In my past races, I finished third and ninth, so I expected to finish somewhere between 15th and 18th this time," Carolla said. "But it's a really amazing feeling to win. And I'm also thrilled to benefit the kids at the children's hospitals—and also the parents, who are by their kids' side around the clock. This win is for the parents!" Toyota will donate $5,000 to Racing for Kids in the name of each celebrity racer and an additional $5,000 to Carolla's charity of choice, Catholic Big Brothers and Big Sisters. Racing for Kids is a national nonprofit program benefiting children's hospitals in Long Beach and Orange County, Calif. Toyota has donated more than $2 million on behalf of the race and its participants to various children's hospitals since 1991. Aasbo, on the left in the accompanying photo, spent the duration of the race battling to overcome the pros' 30-second handicap, quickly weaving among the racers. Though he was unable to make it to the front of the field, Aasbo did score the best lap time of any driver, making the circuit in 1:47:107. Aasbo was happy to stand on the victory stage alongside Carolla and said, "I am so excited just to have been a part of the race, competing alongside all these great people. I feel like I have made a group of great friends here, and I am so grateful to Toyota for putting this all together to benefit the children's hospitals." WOW really looks like you might have something personal against Adam. Talk about bias reporting. Adam has the most downloaded podcast in the world, you might want to do some research before you write your next article. No kidding. Along with having the top rated podcast, he also made the Guinness World Record Bood for most down loads. I also believe Adam has his own starship podcast network. This writer blows! To call this writer a journalist is a complete stretch. Stick with the facts and leave your personal biases OUT of the reporting. Your thinly veiled jealousy of Carolla has no place here. I agree. Adam turned down multi million dollar radio deals to pioneer what is the demise of terrestrial radio. Not be be a Carolla homer but to say his career is on decline would be inaccurate and out of context. Glad he won. Get it on Ace man! GOT to get it on, no choice but to get it ON!!! Just a quick note about a little typo in the title. It should say, "I hate Adam Carolla and here's why."